In the bathroom, you’ll want to add grip bars in the shower and by the toilet. You might find yourself using these bars to help with getting in and out of the tub. You also want to make sure that tub has rubber treads to prevent slipping. There should also be a non-slip mat on the floor. If there are any outlets by the sink, then make sure they’re up to code. You’ll want to put things like towels, soap and tissue within reach. Ideally, there shouldn’t ever be anything on stairs. That means no books, shoes or anything else. If there is carpeting on the stairs, then you need to make sure it hasn’t worn down. Any runners should be secure and the railings shouldn’t wobble. Just imagine putting your entire weight on those railings. That’s a good standard. It is important that those stairs are well lighted. If there isn’t an overhead light, at the bottom or top, then consider adding motion sensor lights. You could probably navigate through your living room with your eyes closed. However, your parents won’t be as familiar with the furniture placement. That is why you want to make sure there are clear pathways. Footstools and ottomans might prove to be a tripping hazard. The same can be said for any other clutter. It should all be removed. Making room for your senior loved one might also require converting a room into a bedroom. To get that job done, you can find help standing by with Junk King Denver. This is a professional junk hauling service that will provide you with a pair of movers and a truck. Those are the essential tools you’ll need to get rid of old furniture and other household items that are taking up space. The less clutter you have in your house, the safer it will become. Let Junk King Denver help you senior proof your home. This entry was posted in Denver Junk Removal and tagged home, junk removal, safe, senior on December 31, 2017 by Junk King. Last updated January 1, 2018 . A backyard shed is a great additional storage unit for your home. Not everything that goes into a shed has to be about gardening. You can keep pool toys and sporting equipment out there. In the winter, it’s a good place to store your grill and bikes. With enough space, you can even set up a workbench for some fixit projects. The best way to make all that happen is to make sure you’re not storing any clutter in that shed. 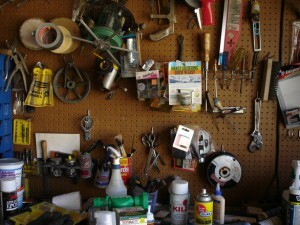 Just like your garage, attic or closet, you could put things in the shed and forget about it. That’s not going to help you get any benefits from that space. Instead, take the time to sort through every item in there and when you come up with a pile of junk that needs to be carted away, give Junk King Denver a call. Junk King Denver is part of a national chain of professional junk haulers who take the hassle of clearing clutter. You’ll be assigned your own persona moving crew who is going to do all the lifting and loading. It doesn’t matter to this crew if what you’re tossing out is rusty or full of spider webs. All they care about is getting it onto the truck. You can also take full advantage of this crew to remove any unwanted items you have from inside your home. Think about how much space you can take back when all the clothes you’re not wearing or the furniture you’re not using can be gotten rid of. How the crew will pack up the truck is going to matter when it comes to the final price. Once they’ve looked over all the things you want to get rid of, they’ll be able to provide you with an estimate of how they’re going to pack the truck. The less space, the less you’ll pay. Not complicated at all. Booking your junk removal session isn’t complicated either. Most sessions are handled within 24-hours. But if you have done all your sorting and your junk is ready to go, then ask for a same-day pickup. Many are available early in the week. Take care of clearing out the rubbish from your home and shed with a call to Junk King Denver. This entry was posted in Denver Junk Removal and tagged Junk King, junk remal, shed clutter on December 23, 2017 by Junk King. Last updated December 23, 2017 .